Image via WikipediaThe Bank of Montreal (TSE:BMO), or BMO for short, is the 4th largest bank in Canada followed closely by CIBC. It operates in many segments of the financial industry like all of the other Canadian banks. It's main operations are in Canada and the United States but it also has offices in 8 other international countries. Most recently, the Bank of Montreal made the purchase of Marshall & Ilsley (NYSE:MI) in a deal with 6.1 billions dollars. The purchase sent their stock price down 6.5% in fear of the sub-prime mortgage debt they were absorbing as they intend to cover all the TARP cost and repayment through the transaction. The drop in price has made BMO attractive form a dividend yield and growth perspective for the coming years. 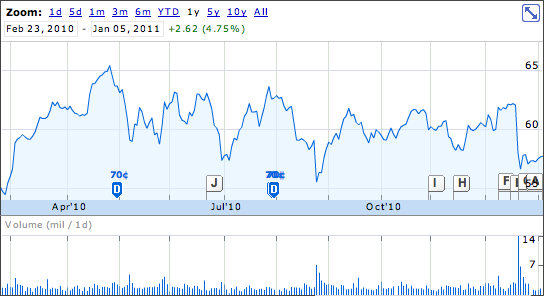 Here is how BMO stock has performed in 2010. 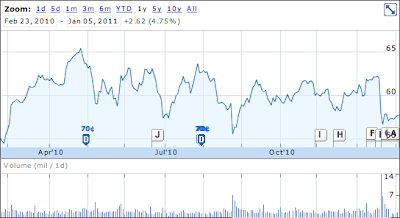 There has been a few buy opportunities in the year but the stock always recovers nicely. I consider this last drop a good entry point for a 4.85% yield. 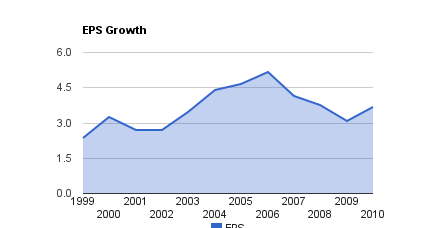 Let's look at the company's dividend growth. 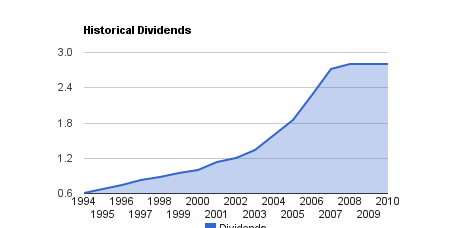 Like many other Canadian banks, it has a steady dividend increase. In fact it had 14 increases in the past 17 years. Many of the years actually had 2 increases for the year. I am hoping to see an increase this year but it may be delayed due to their recent purchase of Marshall & Ilsley. The payout ratio for BMO is above the norm for the banks at the moment with an 5 year average of 55%. The tendency is for the banks to have a 45%-50% payout ratio. There is a simple fix, increase the bank fees ... the Bank of Nova Scotia (TSE:BNS) is doing it in February. A 20% bank fee increase goes a long way in generating revenues. BMO actually has lower fees compared with Scotia Bank. It's at least 30% cheaper based on the future increase at Scotia Bank. Its EPS growth is a little more sporadic. It showed a nice trend up until 2006 and then it started going down a little. 2010 is showing an improvement and we'll need to monitor the growth for 2011 otherwise we may have to look at other banks with a more steady growth. The competitors are primarily the other Canadian banks. Here is a quick summary of the major banks in Canada. All of them are paying a good yield considering they are Canadian dividend aristocrat. This is how the banks did in 2010 when compared against each other. They tend to move together in general. BMO is currently positioned for a good entry point. I would expect them to maintain their dividends even after their 6.1 billion dollars purchase of Marshall & Ilsley. In fact, I think they will manage to increase it either towards the end of the year or early in 2012. With the recent 6.5% drop in value, and their position to grow in the U.S., I see some good growth for the coming years along with some dividend increases. It should generate a good dividend yield over time. Full Disclosure: As of writing, I owned BMO. Disclaimer: Please consult with your financial advisor before making any investments. The information provided within consists of my opinion. Readers: Any interest in BMO?